Following the forced removal of four billboards sponsored by Vaccine Choice Canada in February 2019, we were inundated with requests for information. Of the many dozens of media inquiries, not one asked the most important question. Most reporters made their inquires out of a pre-determined set of assumptions; their position and perspective already cast. It was the rare exception when a reporter showed genuine curiosity and asked questions that indicated a desire to actually learn. The majority were simply looking to confirm previously held biases and wanting answers they could mold into their already formulated narrative. None of the reporters asked the most important question as pertains to the vaccine issue. It’s a simple question and is the only information that really matters in the end. So, if it’s the most important question, why did none of the reporters ask this question? I’ve not met one parent yet who says – “I don’t want my child to grow up strong and healthy and have a rich and rewarding life”. The problem is that we have been given conflicting information about what will enable our children to grow up healthy. Those who are pro-vaccine have been convinced by the for-profit medical industry that vaccinating their children with each and every vaccine that is developed and recommended is the path to health. While parents, like myself, who have had a child severely injured or killed by a vaccine, are not convinced that vaccinating with each and every vaccine brings health. Our personal experience with vaccination has indicated otherwise. We now chose to vaccinate selectively or not at all. Unfortunately, vaccination has become an ideology rather than a voluntarily chosen, evidence-based medical decision. Those who are ‘pro-vaccine’ have become increasingly vocal that everyone must partake. Everyone must believe as they believe. There is a growing movement, fueled by the for-profit medical industry, to eliminate ‘vaccine choice’ and the medical ethic of informed consent. I suggest the reason the most important question is so rarely asked by reporters is because those in the mainstream media think they already know the answer to the question. It’s either that or they don’t like the answer. Therefore, the question and the answer is ignored, denied and dismissed as irrelevant. This was the strategy adopted by the US government when doubts about the safety of the polio vaccine were raised. So, what is the answer to the most important question? The answer is that we don’t really know. 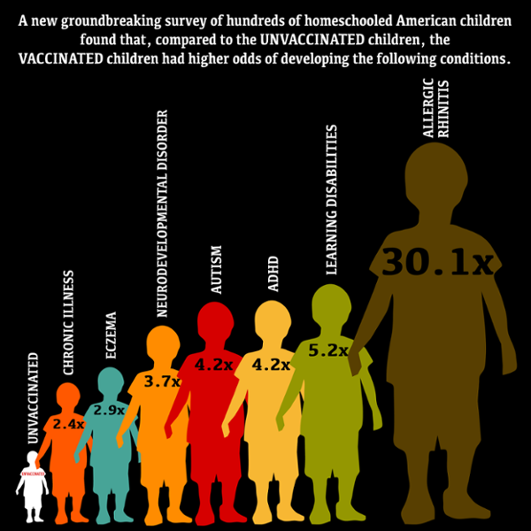 We don’t know whether fully vaccinated children are healthier than unvaccinated children because the science has not been done to the level that would produce an irrefutable conclusion. But let’s be clear, the science has been done. In 2017 the Journal of Translational Science published the first independent, non-industry funded study comparing the overall health of vaccinated and unvaccinated 6 to 12-year old children in the United States. The results of the study revealed that while vaccinated children were significantly less likely to have chicken pox or whooping cough, they were significantly more likely to have pneumonia, allergies, otitis media (ear infection), eczema, a learning disability, Attention Deficit Hyperactivity Disorder (ADHD), Autism Spectrum Disorder, neuro-developmental disorders, and chronic illness. This result should alarm us all. And to be clear, it does alarm those of us who are aware of the study. The problem is the study got a result that conflicts with the current narrative that vaccines are “safe and effective”. The study should have sent a powerful message to Public Health and modern medicine. It should have been a clarion bell bringing everyone to attention with demands for more research of this kind. But that didn’t happen. Instead, what we got from governments, the for-profit medical industry and mainstream media was silence. The only scientific way to determine whether vaccines are the “safest, most effective and best way to protect our children” is to conduct large, independent, vaccinated vs. unvaccinated studies. Health Canada has never conducted such a study. Instead, the for-profit medical industry measures success based upon vaccine uptake. This is an irrelevant measurement of success. Much of what purports to be science today and those who purport to value the scientific method are not really interested in uncovering the truth. They are interested in confirming a previously held ideology. And this study produced results that ran counter to their ideology. This is not unlike the time in human history when most held the belief that the earth was the center of the universe. When Galileo proposed that the sun was the center of our solar system, this information opposed the prevailing ideology/theology and could not be allowed to exist. Galileo was ridiculed, marginalized, shamed, dismissed and even jailed. We see this same behavior today when parents of vaccine injured children share their experiences and researchers uncover scientific evidence that does not conform with the prevailing ideology. I understand why each and every reporter from our mainstream media failed to ask the most important question. It is akin to asking Galileo if the earth revolves around the sun. They can’t ask the question because they can’t bear to hear an answer that may conflict with their ideology. This is the unfortunate state of science, the for-profit medical industry, and the corporate controlled media today. This is a question they dare not ask because knowing the answer would change everything. Too much is riding on the current ideology of “vaccines are safe and effective”. An entire medical paradigm has been built on this edifice. Too much money is invested, too much financial gain is at risk, too many reputations are at stake, and too many livelihoods are dependent on us not knowing the answer. However, parents today are growing weary of this uninvestigated ideology. The absence of real scientific evidence of vaccine safety and effectiveness leads informed parents to conclude that the vaccine paradigm is not evidence-based medicine and is more akin to religion than science. Parents whose children have been harmed by vaccines will no longer accept the vaccine ideology on faith. Their trust has been broken. They insist on real scientific evidence. It is critical that we ascertain whether the opinions about vaccine safety are based on hope, faith, fear or actual science. It is time that we push beyond using ‘belief’ as the basis for the vaccine decision and instead decide from a place of information based on quality scientific evidence. But this is counter to what our governments, for-profit medical industry and financially conflicted media want. The tension is growing. This tension will not be satisfied by vaccine mandates, coercion, shaming, dismissing, denying or marginalizing the growing segment of society who insist on scientific evidence and the right to choose. The truth will come out. The only question is when?